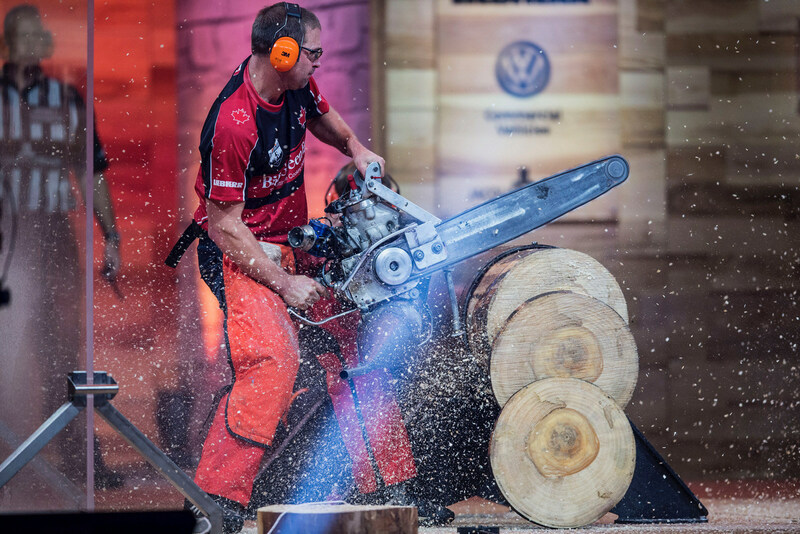 WAIBLINGEN, Germany and LILLEHAMMER, Norway – Competing for Canada, Mitch Hewitt chopped and sawed his way to a third-place finish in Norway at the Stihl Timbersports 2017 World Championship. The event in Lillehammer, Norway, was the 2017 season finale for the global series. Jason Wynnard (New Zealand) emerged as the world champion, while Brad De Losa (Australia) took the silver medal. “I had a goal in mind and we trained very hard this week and I had a great championship. I won three events, including springboard which is my specialty, and in the end we got the results we came here for. I want to thank my team (Team Canada) for their support today and I am very happy to bring this medal back home to Canada,” Hewitt says. Mitch Hewitt competing in Lillehammer, courtesy of Stihl Timbersports.Hewitt is the 2017 Stihl Timbersports Canadian champion. He led Team Canada in the team event at the world championships in Lillehammer. Mitch (Scott Creek, B.C.) was joined by 2016 Canadian champion Stirling Hart (Vancouver), 2015 Canadian champion Marcel Dupuis (Memramcook, N.B. ), Nathan Cumberland (Keswick Ridge, N.B. ), and the newest member to Team Canada, Nick Russell (Port McNeil, B.C.). Team Canada brought a strong performance against Wynnard’s Team New Zealand in the semi-finals, New Zealand prevailed to win the world championships. 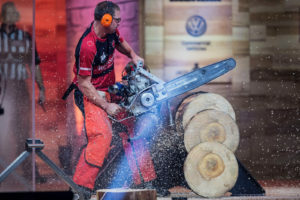 Russell was selected for Team Canada after setting a new national record in Stock Saw during the 2017 Stihl Timbersports Canadian championships, held in August in London, Ont. Another newcomer to Team Canada is 2017 Canadian rookie champion, Thomas Henderson (River John, N.S.). Kelly Bowness from Alberton, Prince Edward Island, demonstrated great agility and precision to win the Stihl Canadian women’s competition at the London event. Stihl Timbersports is an international logger sports competition series. Its roots lie in Canada, the United States, Australia and New Zealand, where local loggers would hold competitions to determine who the strongest man was. Today, athletes compete in national and international events featuring three axe disciplines (Springboard Chop, Underhand Chop and Standing Block Chop) and three sawing disciplines (Single Buck, Stock Saw and the open class, modified Hot Saw).